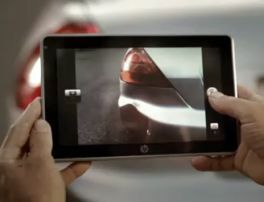 HP today launched its tablet PC, the HP Slate 500! The HP Slate 500 is a 9-inch Windows 7 tablet PC aimed at business users. The Slate 500 has a touch screen user interface which is not customized for the tablet. It comes with the standard Windows 7 with a stylus! The tablet has some impressive specs. It runs a 1.86GHz Intel Atom Z540 with 2GB of Ram and a 64 GB SSD hard drive. It has a 1024×600 resolution screen and supports HD video. It also has a USB port, an SD card slot and a front and rear facing 3 mega pixel camera. It is set to retail at $799 as a package which includes a docking stand, carry case and a stylus. It seems quite expensive for a standard Windows 7 tablet.